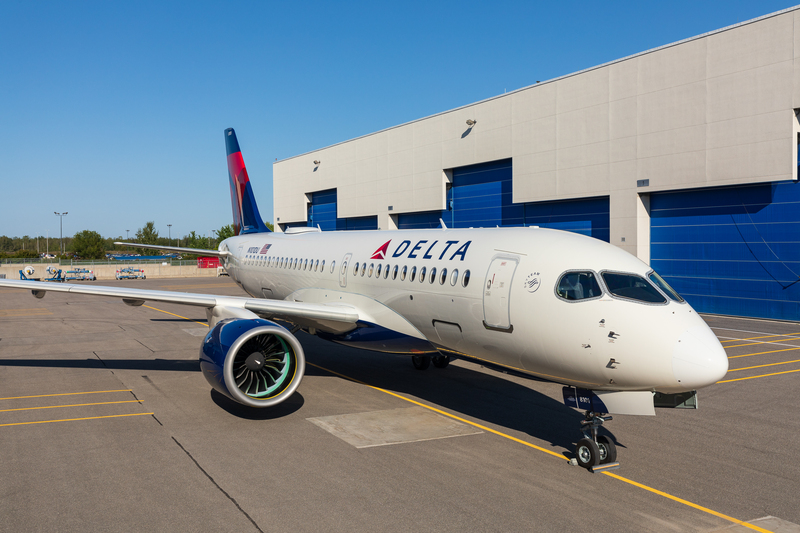 Delta Air Lines Inc. today announced it will begin offering domestic business routes on the new A220-100 aircraft, a state-of-the-art narrow body jet with amenities that match a widebody aircraft. Tickets go on sale tomorrow for July 2019 service from Houston-IAH to Detroit Metro and on Oct. 20 for March 2019 service from Detroit Metro Airport to Dallas/Ft. Worth. More Detroit Metro flights are expected to be announced in the coming months. Inaugural A220 flights are set to depart on Jan. 31, 2019, from Delta’s hub at New York’s LaGuardia airport to Boston Logan International, and from LaGuardia to top business destination Dallas/Ft. Worth. Other routes were announced, though only two flights so far include service to or from Detroit Metro. Delta is the first U.S. airline to take delivery of the A220, formerly known as the “C Series,” which will feature a modern interior with a spacious, widebody feel, and better fuel performance. 109 seats total, including seating for 12 in first class, 15 in Delta comfort+, and 82 in the main cabin. The interior features seat-back screens, 2Ku Wi-Fi, and among the widest seats of any narrow body aircraft. The main cabin features 18.6″ wide seats in a two-by-three layout. Each customer will also have personal power ports and complimentary premium entertainment on individual seat-back screens. Customers flying in Delta Comfort+ on the A220 will find more legroom and dedicated overhead bin space, in a customer-preferred two-by-three seat configuration. In the first class cabin, customers are offered a new, modern seat design in a two-by-two layout, featuring the largest IFE screens of any Delta domestic First Class seat. Powered by Pratt & Whitney’s latest geared turbofan PW1500G engine, the A220 takes advantage of advanced technology and composite materials designed to deliver an expected 20 percent improvement in fuel efficiency over similar-sized aircraft when it enters service with Delta.